Intel Developer Forum is a big technical media event. There are lots to see and the media coverage is huge. Here is a partial picture of the media room as people are busy writing about Intel’s latest announcements. This room can hold over 200 people and it is full. I caught Eleanor moving, and here is a better picture. Ran across an interesting piece of work out of Intel Corp. 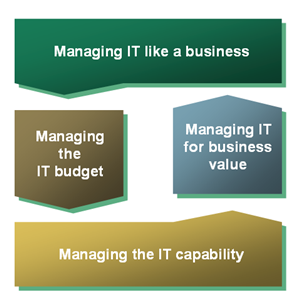 The IT Capability Maturity Framework trys to take a stab at a common problem. What attracted me to this framework was the business oriented approach this framework takes. But after digging through their site I was hungry for more information. I couldn't find much more information besides a high level explanation. They do have a sample assessment out there that give you a better idea of the framework. From the synthesis of leading academic research, proven industry best practices and Intel's own experience in transforming the Intel IT organisation, Intel developed the IT Capability Maturity Framework (IT-CMF). Based on the lack of existing frameworks and the huge appetite from other top Business and IT executives for such an approach, Intel has decided that the best way to further develop and disseminate the IT-CMF, its associated tools and practices is to have it included as part of IVI’s research and education agenda. So, this is cool, but then I realized I missed Eleanor’s presentation on Social Networks. What does Social Networks have to do with data centers? Social Networks characterize the behavior in the data center system for those companies/people who are doing the most innovative work. Eleanor and I had a chance to talk for 3 hours at IDF, so I learned a lot even though I missed her presentation. One big concept which was helpful to describe issues is the “tribal knowledge” in IT vs. meme. Which gets to my point of why Social Networks and Memes are important characteristics in Innovative Green Data Centers. The most innovative people in data centers are networked to share and receive ideas. The social network enabled organizations know this. Your head may hurt with these concepts, but here is summary to help you. My head hurts a little bit too, but I’ve been playing with these ideas for a while, and luckily I can follow up with Eleanor. Some of the most innovative data center people are figuring out how to build their data center social networks as a competitive advantage.